If you are looking for a good, wholesome family movie, the VeggieTales flick, The Pirates Who Don't Do Anything, is definitely one to see. Overall, it captures a young one's attention from the beginning and at times, has them laughing and wanting more. The movie definitely follows the VeggieTales theme, and while it's not a huge box office hit like many Disney movies, it still is a good story and teaches a lesson about becoming a hero. 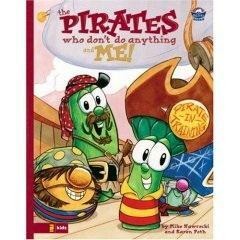 The Pirates Who Don't Do Anything is the second VeggieTales flick to hit the big screen. In 2002, Jonah: A Veggie Tales Movie was a top 10 box office hit, grossing roughly $19.5 million. The Pirates Who Don't Do Anything' is the tale of three misfits who take a trip through time back to the 17th century to protect royals Princess Eloise and Prince Alexander from an evil pirate, Robert the Terrible. The misfits, Elliot, Sedgewick and George (played by Veggie Tales characters Larry the Cucumber, Mr. Lunt and Pa Grape), are 21st century cabin boys at the "Pieces of Ate" dinner theater. Because of their laziness and lack of self-confidence, the trio feels they can't be the heroes their friends and families expect them to be. They even go as far as trying out for roles in the dinner theater's pirate performance, but fail at that as well, causing much havoc. The result? All three of them were fired. Through a series of events very characteristic of a VeggieTales movie, the misfits arrive in the 17th century via an electronic "HelpSeeker" and become Princess Eloise's heroes. They spend a good portion of the movie proving her wrong and taking advantage of her good hospitality, but soon realize that they were brought there for a reason: To help out the royals. After facing and conquering several obstacles such as an ornery mechanical dragon, some rock monsters and a herd of toothy cheese puffs, the misfits really do become heroes and rescue the prince and princess. After receiving special medals of honor, Elliot, Sedgewick and George head back home to the 21st century, unknowingly bringing the evil pirate back with them, who overtakes the dinner theater where the veggie-trio used to work. The "heroes" wow the audience and former employer by defeating the angry pirate. It was then they felt like true heroes in front of their family and friends. The moral of this VeggieTales movie was not quite apparent as some of its other videos, nor was it discussed in length at the end of the movie. But the lesson learned was a simple one for youngsters to understand: Be true to yourself and your true character will come shining through. Being a hero is hard work, but not when you believe in what you are doing and work hard at it. While there were many parts of this movie that were good, the music video shown during the credits was probably the best part (especially for the adults watching). If you loved The B-52's Rock Lobster, then you will love Veggie Tales' Rock Monster. Several of the VeggieTales were "dressed" like members of The B-52's and the tune was quite catchy. For a glimpse at the video, check out the VeggieTales Web site. The soundtrack for the movie is also available through this site. This was a good movie, especially if you are a VeggieTales fan. It may not be the best movie for a toddler, but preschoolers and young elementary school children will find enjoyment in most of this family movie. Albeit, some elements were a bit frightening (the mechanical dragon), but overall, if you can't see it in the theater, it will be a good movie to add to your DVD collection of kids' videos.